Casa Estrella Grande is an incredibly charming, light-filled home with a true San Miguel pedigree. Situated in historic Centro, only two blocks away from the Jardin and our famous Parroquia, its address is on Calle Aldama, recently named 4 th Most Beautiful Street in the World by Architectural Digest.From this famous street, you enter a hallway leading to a verdantly lush and quiet garden courtyard with mature foliage. Tall French doors facing the terrace lead to the living room, dining, and kitchen. The beautifully proportioned living room is anchored by a large carved stone fireplace and the elegant dining room also has a fireplace.On the second floor, an open-air loggia overlooks the courtyard. A breezy hallway leads to a sunny landscaped terrace overlooking the street in front and to two spacious bedrooms and baths towards the back.At the back of the house, reached via a romantic, almost hidden staircase is a secluded swimming pool and terrace that could have been at home in an ancient Roman Villa. The third level is a rooftop terrace with spectacular views of the nearby Parroquia. 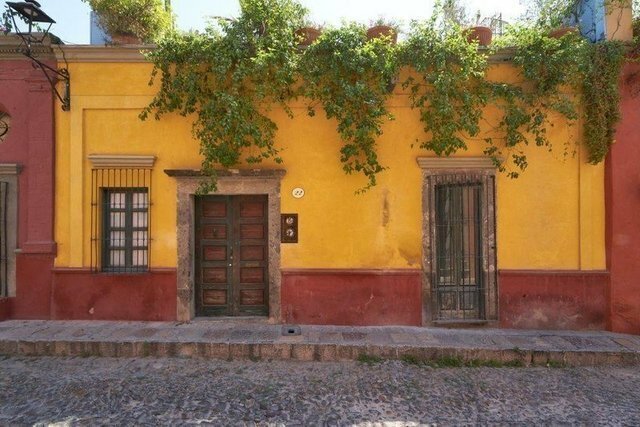 Residents have a front row seat to San Miguel's legendary sunsets, holiday firework displays and traditional wedding parades that dance down Calle Aldama.The assets of Casa Estrella Grande are hard to exaggerate. The location is the absolute best in town, and the privacy, serenity, abundant natural light and congeniality of this home make for a truly authentic San Miguel experience.